After all my moaning I got the S-8800 today……Quite happy with it to be honest. Sound is very good, baas and Treble controls make a big difference especially when using narrow filters. Fantastic ergonomics , it’s a pleasure to use. SSB performance is excellent and no distortion like the PL-880 which isn’t too bad to be honest. My radios may have some newer updates compared to earlier purchases, I did not yet notice any Birdies that are in the bands I was listening to. I have not compared it yet to my old PL-660 but just a quick test compared to the XHData D-808 and it is more sensitive for sure , the fact the S-8800 is quieter certainly helps and the audio quality of the S-8800 is far better. But the difference in price you can’t beat the D-808. On SSB and SW the S-8800 pulls in signals clearer that I can hardly hear on the D-808 or they just can’t be heard on it at all. I must create some comparison videos between the S-2000, PL-660, PL-310ET , D-808 and the PL-880. MW/LW reception is very good makes the PL-660 and 310ET seam deaf by comparison on these bands. I have not compared it to anything else yet I only got to play with it for about 30-40 mins so more testing needed but I can see myself hanging on to this radio for years. I think Tecsun could do better with their designs. I’d love to see analogue displays , then they could excuse that poor horrid LCD they continue to use. 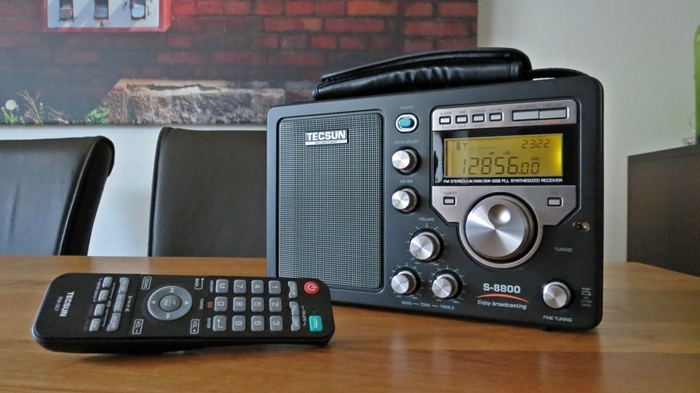 It looks cheap and awful, come on Tecsun…….. At least an analogue display would make it look better and I love analogue tuning radios, I ordered the R9700DX because I actually like the look of that analogue display. Thanks for putting this hands-on review together! This statement means “( no external power supply possible, no 12V socket). Batteries can be charged while the rx st still in use,” seems to be mutually exclusive. Does it have sync detection, and how good is it? I am a long wave radio listener and I need something like this that covers long wave. Every other radio I bought that was a Grundig field radio was the S-350DL, S-450DLX, and Grundig Field (S550) and all three did not include the LW band. I hope they bring this to Kaito Electronics and sell it on Ebay, because if they do. I am getting one sent home to me. I hope that the 8800e will be available to the United States since we are able to receive distant LW broadcasts from Europe and out in the Pacific, and we use the LowFER’s band from 160 kHz to 190 kHz, and listen and log Non Directional beacons as a hobby and profession. Is the AGC still fast like on the PL-880 and is there an RF-gain ? I’ve given up on all my Tecsun SW receivers because they are hopeless on SSB. AGC too fast, front-end over loads easily, high noise floor and no variable attenuation. Alright for broadcast listening but anything else – forget it. This receiver looks like a BCL-3000 on steroids. Does not inspire confidence. I own this radio. It’s . Performance on AM and SW is better than my Kaito 1103 and Sangean 909x. My Grundig Satellit 750 beats it on SW. The 8800 is a bit better on AM than the 750, though. The 8800 and my GE Super Radio 1 are just about equal on AM. The 8800 beats my Panasonic RF-2200 on SW, but not on AM. I didn’t compare it to my other radios on FM, as I really don’t listen to that band nor have any interest in it. I did try out the FM band, though. It seems to have good sensitivity. The speaker provides good sound quality, but not Super Radio good. Display looks outdated. Not a fan of those amber/yellowish displays with spotty screen coverage. Not even close to the display on my 909x. But then again, no other radio comes close to the 909x’s display. Why can’t manufacturers implement nice bright white lit displays like the 909x? The remote works ok. Btw, all comparisons were done utilizing each radios’ own built-in AM and telescopic antennas for SW. Overall, I can compare it more closely to the RF-2200, but with 8800 having slightly less sensitivity on AM and better on SW. The two even look almost the same. The 8800 seems to be an updated and refined modern design borrowed from the RF-2200. The RF-2200 gas a more robust solid built, though. Overall, I give the 8800 a score of 7.5. I was wondering of this radio had hidden menus like the 880 did that you have to find out about through second sources as they weren’t listed in the original owners manual? It looks awful and on visual will never sell. A few people who read specs. may buy it. It looks like one of the many cheap am sets that flood ebay all the time. Please Tecsun take it back into your design department and start again. To me it lacks attraction unlike the PL-880 which I think looks 100% like a radio should look. How does this compare to the 8800 that was release in 2015?